Published: Dec. 23, 2018 at 10:29 p.m. Published: Dec. 10, 2017 at 03:24 p.m. 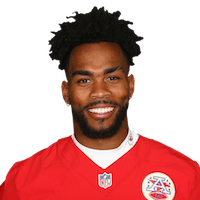 Published: Oct. 8, 2017 at 10:12 p.m.
Kansas City Chiefs running back Charcandrick West outruns defenders for a 4-yard touchdown. Published: Oct. 8, 2017 at 09:38 p.m.
Kansas City Chiefs quarterback Alex Smith fires to running back Charcandrick West for an 8-yard touchdown against the Houston Texans.